Welcome to Bob and George. If you're reading this, it probably means you've decided to read the entire comic archive, starting with the first comic. Whether this is your first time or your twentieth time, I hope you enjoy your visit. This little box down here is where you can read my commentary for many of the comics, including general thoughts and interesting side notes about the comic, the sprites, and sometimes the special effects I used. For example, in this first comic, we have Mega Man introducing himself (which is generally a terrible way to start a sprite comic) and mentioning that the comic isn't ready yet. 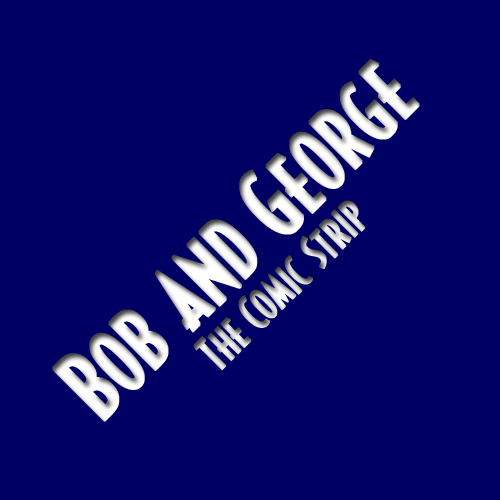 As you may know, the comic was originally supposed to be hand-drawn and about the college adventures of two brothers named Bob and George. I had set April 1st as a self-imposed deadline to have it ready to go, and as the date approached, I found myself still without access to a scanner to digitize any of my drawings, so I threw together some filler using downloaded Megaman sprites. What you see up there isn't the original version of this particular comic (or strip, as I used to call them). When I first started, the only graphics programs I had access to were Microsoft Paint and Microsoft Photo Editor, neither of which are particularly good at creating GIFs, the image format of choice for the internet at the time. This left me with the choice of publishing the comics in either Jpeg or PNG format. Unfortunately, while PNG preserved the crispness of the images, the format was still relatively new in 2000, and the majority of readers' browsers couldn't handle it yet. That left me forced to use Jpegs, which while suitable for photos, for images with crisp lines like sprite comics, the result is a blurry mess. A year or two into the comic, I went back and remade the first batch of comics to match the graphical style I developed later, but I kept the original Jpeg versions around, in case anyone wanted to see them. If you're interested in seeing what this first comic originally looked like, click here at your own risk.